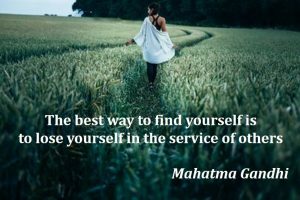 The idea is to do something nice and kind for someone else without a lot of advanced planning or expecting anything in return. I’m sure you’re already doing random acts of kindness here and there. Think about the last time you’ve done something nice for a neighbor, friend, or even a total stranger. How did you feel after you did something kind? You felt good about yourself didn’t you? You’ve felt proud and accomplished. And most importantly, you started to feel better about yourself. 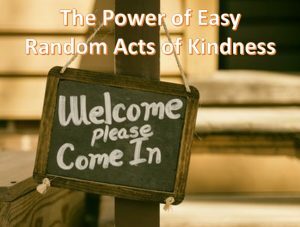 Doing easy random acts of kindness is a great way to boost your self-confidence. It makes you feel important. It makes you feel like you’re part of the community, no matter what that community may look like or consist of. We are social creatures who benefit from cooperation and working together for the common good. Feeling good about showing someone else a kindness is programmed into our DNA. 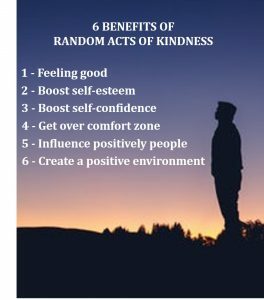 Take advantage of this fact by being kinder and done random things that benefit others. It’s a nice way to boost your self-esteem and benefit your community at large. Start by keeping your eyes and ears open. Pay attention to the people around you and your environment. When you start to pay attention to “kindness opportunities” throughout your day, you will start to notice them everywhere. We are talking about easy acts of kindness because they don’t have to be anything big, but something like smiling to a stranger. This won’t take you more than a minute, but these acts brighten the other person’s day and make you feel good about yourself. Pick up the trash you come across on your daily walk. Buy the coffee drink for the person behind you in the drive-through or at the coffee shop. Offer to help bag and carry out the groceries for the elderly shopper in line with you at the grocery store. Help the young boy in your neighborhood study for his big math test. Offer to run an errand for a sick neighbor or stop by with some pre-made meals. Offer to babysit for your friends with little kids who haven’t been out on a date in months. These are just a few ideas. All over the web, you can find many handy suggestions. Check these 100 random acts of kindness for more best random act of kindness ideas. I embarked in just giving assistance to poor people hosted in a charity near my home. These were poor guys homeless. The charity organizing this needed supporting people. My random act of kindness was accepting doing it for a while when asked for help. I had simply to open the location where these poor people were hosted for the night, supporting them with the dinner and be sure none was missing. It was not a difficult task at all, however I was quite uncomfortable with it. I’m not a very social nor very socially committed guy, so I felt this time I had to help. And wanted doing this. I did it for every other Sunday for four months. It wasn’t difficult, but it was hard. Sticking to this commitment, feeling uncomfortable, but at the same time feeling good for helping those people. At the end, I did something good and helpful and I felt great. And understood that I could handle with discipline a new and uncomfortable but useful and important experience. And you can bet this improved my self-confidence. A random act of kindness is one of the more positive actions you can do. It will expand your self-esteem as you will feel “a good guy”. But, as you can see in my personal example, often it will lead you outside your comfort zone. Going outside your comfort zone is one of the most important approaches in developing your self-confidence (see Develop Your Unbreakable Self-confidence by Being Adventurous), and easy random acts of kindness are a very rewarding way to do so. Both your self-esteem and your courage will benefit and both will improve your self-confidence. 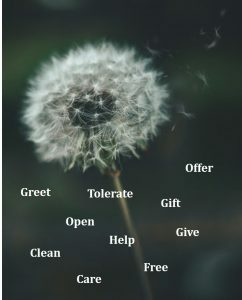 Give it a try and see for yourself how good these kind acts make you feel and how they boost your self-esteem. Have you already done this? How did it go? 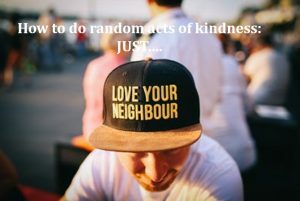 Share with me some easy random acts of kindness you’ve done in the past. This kind of exercise is so important we have devoted one day of my 30 day confidence challenge to this topic. Subscribe to my challenge with the form below develop your self-confidence and learn more. 8 Engage in the 30 Days Courage and Self-Confidence Challenge!